Visitors study a floral design by Alora Carrier, Layne Gregory and and Sabrina Warner of St. Mary’s Garden Club at the PMA’s Art in Bloom exhibit Wednesday. Guests were treated to dazzling floral arrangements by 13 local artists, garden clubs and floral designers who used artists’ paintings to inspire their creations. 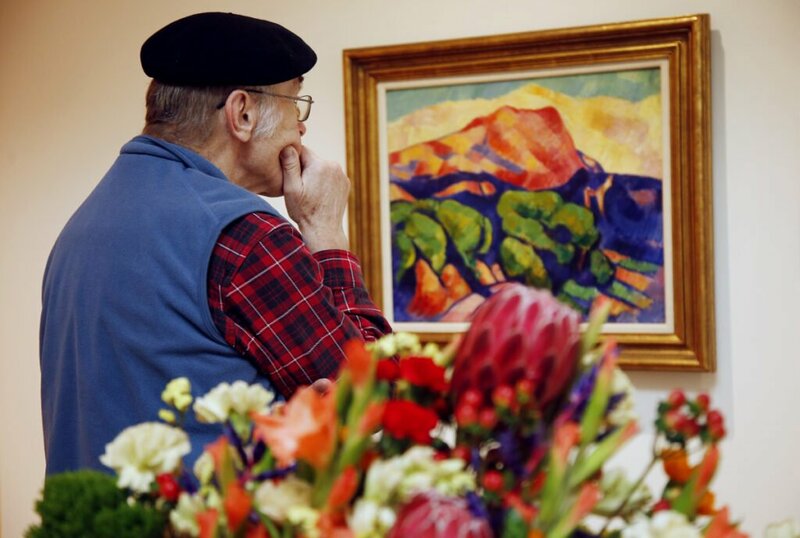 The exhibit, which will run through Sunday, offers winter-weary Mainers a brief infusion of the season to come in the form of colorful, uplifting flowers, museum officials said. Nearly 400 people, most of them museum members, braved snow-clogged city streets to visit the museum on Congress Street, said Marcie Griswold, the museum’s director of visitor experience. “People want color. They need it,” Griswold said. Art in Bloom, which was revived last year after a hiatus stretching back to the 1990s, attracted about 5,000 visitors in 2018, said Graeme Kennedy, the museum’s director of communications. He expects comparable visitor numbers before the exhibit closes Sunday night. “People love to have a touch of spring now,” Kennedy added. 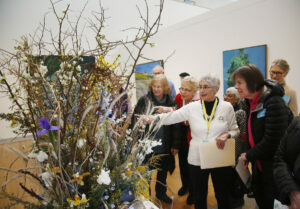 Docent Mary Mary Collins talks about a floral design by Stacy Brenner of Broadturn Farm, inspired by “Icelandic Picnic” by Loiusa Matthiasdottir, during a tour of Art in Bloom at the Portland Museum of Art. The exhibit’s diverse works are based on paintings of Monhegan Island, Mount Katahdin, a picnic in Iceland, and a gigantic moose, to name a few. Amy Maloney, owner of Pretty Flowers Maine, said she based her floral arrangement on a recent trip to Monhegan Island and a painting of Monhegan Village by Emil James Bisttram. “To work with a perishable product, knowing it will wither, is a regular lesson in life’s fleeting passage,” Toscano and Thomas wrote. Keith and Claudia Truesdale of Kennebunkport study a floral design by Amy Maloney of Pretty Flowers Maine, inspired by “Village of Monhegan, Maine,” by Emil James Bisttram, during the tour of Art in Bloom on Wednesday. 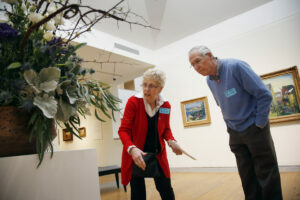 The Art in Bloom exhibit will be open 10 a.m. through 8 p.m. Thursday, Friday and Saturday. It will be open on Sunday from 10 a.m. to 6 p.m. The event will also feature a film on painting the modern garden; members of the Portland Symphony performing in the galleries; a hands-on paper-garland-making session and mead-tasting party, and a Sunday morning Jazz in Bloom performance. 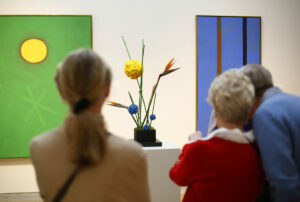 A guided public tour of Art in Bloom will begin at 10:30 Thursday morning. Adults pay an $18 admission fee unless they are museum members. Anyone age 21 or younger gets in for free. The museum does not charge admission on Friday from 4-8 p.m.